Just when I think I have this child pretty much figured out, I realize I really have not a clue what he is about on any given day. And, you know what? I think he likes it like that. I think he likes playing fast and loose with my mind...secretly planning to do just the opposite of what I predict in my mind that he will do. (Between you and me, it makes life just a little more exciting around here not to have it all going according to thought and plan all the time.) This week was Alex's homecoming week at Carmel High School. They had the different days of dress all week, etc., customary for the homecoming festivities, so at the beginning of the week I said, "Are you going to do the special outfits each day this week for homecoming?" His answer, "Well, I am going to do one of the days only." My reply, "Okay, do we need to get anything special for it or what have you?" His reply, "No, Mom, you don't need to worry about it as I have it all under control and I don't need any help." I have learned...end of story, don't ask further unless absolutely necessary. I waited. Pajama Day came and went, he exited the house in regular school attire. Same with Western Dress Day. Likewise on Wednesday with Pirate Day. Spirit Day, regular attire also. Hmmmm...and then, will wonders never cease, especially with Alex in this regard, he descends early of a school morning dressed in full suit coat, dress shirt, tie, dress pants, etc. for Dress Up Day. You could have knocked me over with the proverbial feather. I looked at my husband, he looked at me, we were both speechless. It was not a wedding. It was not a funeral. It was not Cotillion. It was not a formal occasion. 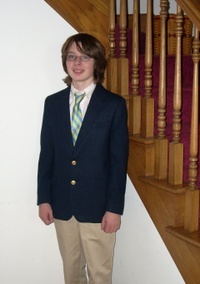 And, yet, here was The Cool Dude all dressed up on a day when it was OPTIONAL. As I said, I think that he is just playing fast and loose with my mind...trying to keep me always guessing...that teenage thing where parents are on a "need to know only" basis. Okay, you all know Alex...did any of you see this coming? Anyone?